I shared this quote with my therapist before the weekend, and it even stopped him in his tracks as he got silent and then said “Wow!” .. yes I agree “WOW”. I live and breathe this quote everyday. When things are tough – hold on – because something will change; something will be different, and if it doesn’t change, I have the choice to make it change – be the change. This weekend I felt a small shift, a small change, a little empowerment. I spent some time this weekend reading, taking time to understand things a little more, and in that, I felt a shift – not a huge shift, but enough to feel something different. My life has always been about “waiting for a change to happen” to move to the next step, to the next step, to the next step to get through what I was going through. I have learned so much in the past 6 years on this healing path that – when things are hard, just wait .. it will change – When feelings are hard, just hold on, something will turn around that will provide understand or a lesson to move forward. It’s incredibly hard to stand still and wait for change when it feels so painful or hard. You wonder to yourself “is this ever going to end?” – and the answer is yes.. it does, and it does get better. 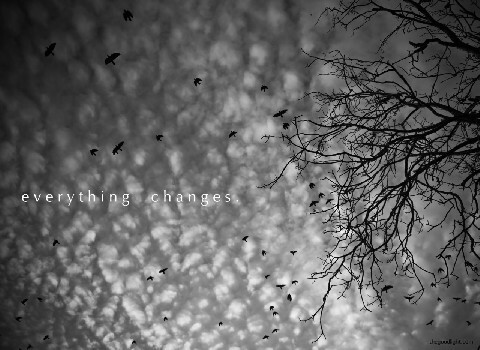 Sitting here tonight I can say “things are changing for me – a good change”. Maybe it’s slow, maybe it’s small – but I know if I keep walking towards the change, it will keep moving me in the right direction, and if it stops or gets hard again, I know it can shift, and I can move with it and know I am okay. I took small steps this weekend. I went to the gym (very briefly) and worked out! I am pretty proud of myself, and as I suspected the endorphins running through my body left me with this “why the hell did I ever walk away from this, this is AWESOME!!!”. I patiently read a whole book this weekend (Daring Greatly by Brene’ Brown) .. which is big for me because I can never sit long enough to do anything without wanting to get up and be busy. Change always happens in the struggle, you just have to hold on and wait for the change to happen, and sometimes you have to be the one to change if something doesn’t. I “get this” writing! Really get it. Thanks for sharing. Karen, I love this and it’s so true! You have so much support no matter where you are in life good or bad, joy or hardship!